The scrollsaw really is a delightful tool, and pretty much the safest power tool that one could hope to use. Oh sure, it’ll bite if you get careless, but you won’t lose a limb or finger. There’s a wide range of things to make with it, ranging from simple (eg. a simple puzzle) to complex (eg. intarsia). Here’s a sampling of projects, most of which don’t fit in anywhere else. 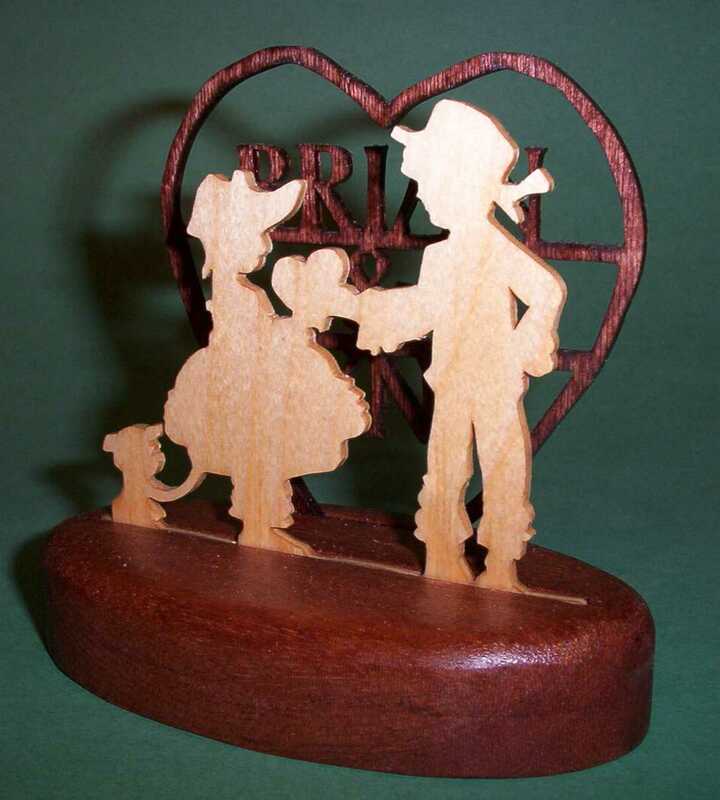 Here’s a Valentine’s Day gift that I made for my wife in 2006. The heart with our names at the back was my modification to the original design. Both of the scrolled pieces are from 1/8-inch baltic plywood, and the base is sapele. It’s a small piece, about 4 inches wide at the base. Here’s a birthday “card” that I made for my sister to go along with the intarsia haida eagle. 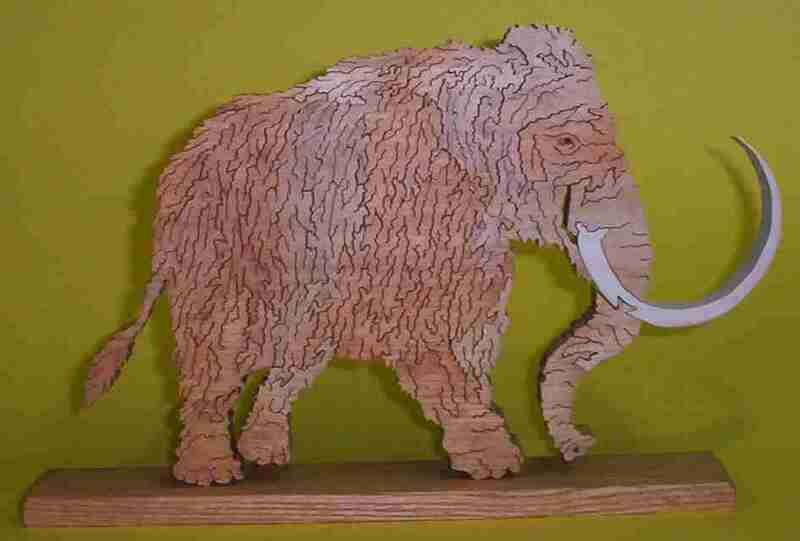 It’s made of 1/4-inch baltic birch plywood, and painted with acrylic paints. We signed the back of it. 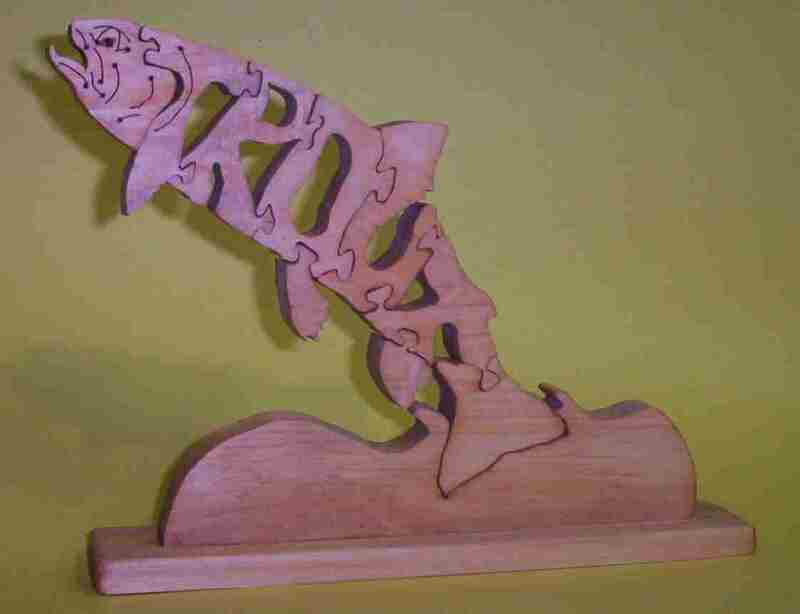 Here’s another “woodimal” project, this time spelling out “TROUT”. Done in pine, with a natural danish oil finish. I made this for a co-worker whom I thought needed a bit of cheering up. 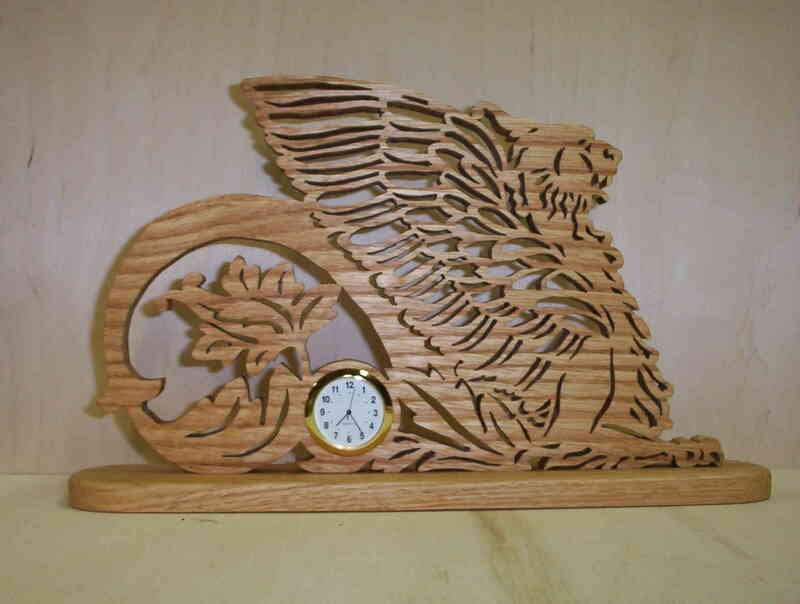 This is a fretwork dragon with a small clock. He stands about 8-inches tall. 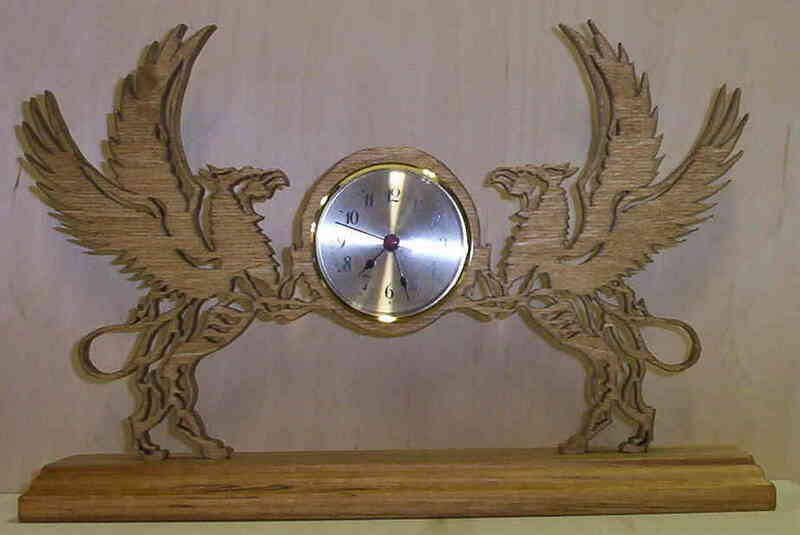 This one is made from 1/2-inch oak, finished with a natural oil. Yet another clock! This one is a pair of gryphons. It’s about 15-inches wide. 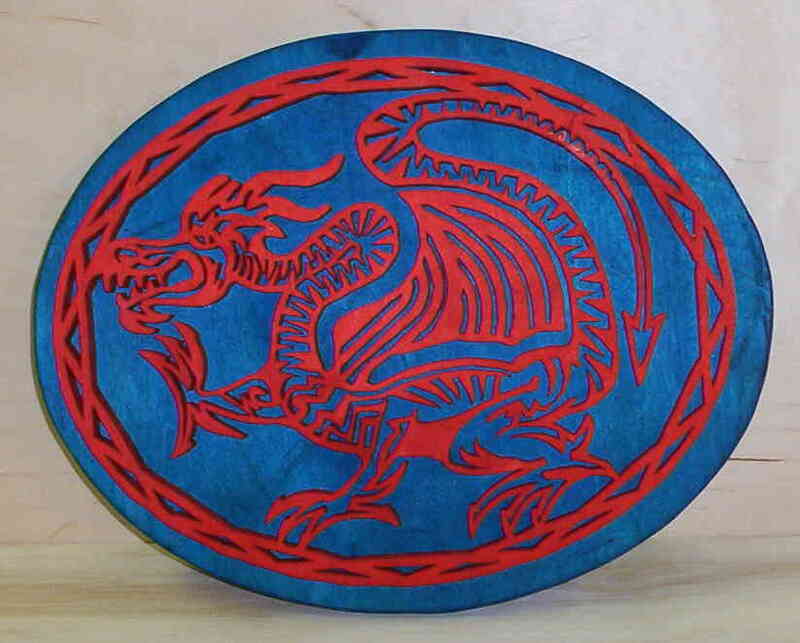 This fretwork dragon, and the back piece, are dyed using analine dyes. 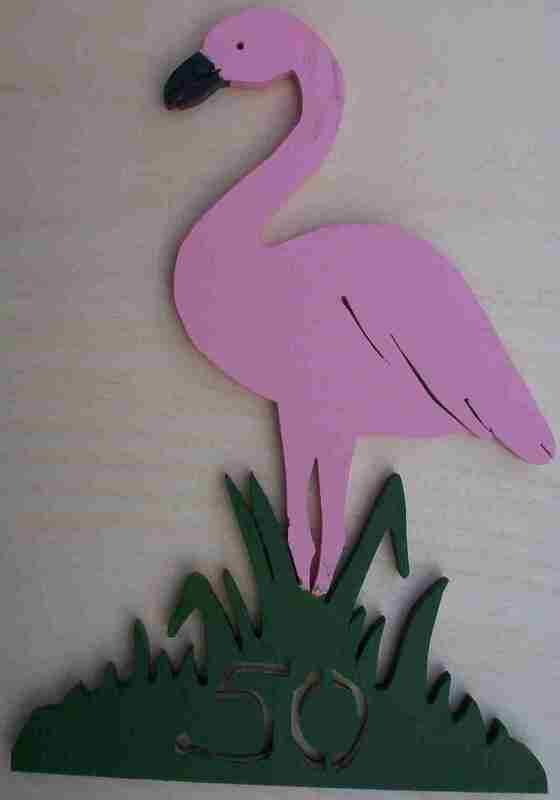 There are a few “floating” sections within it, making cutting it out something of a challange! The back is about 15-inches wide. 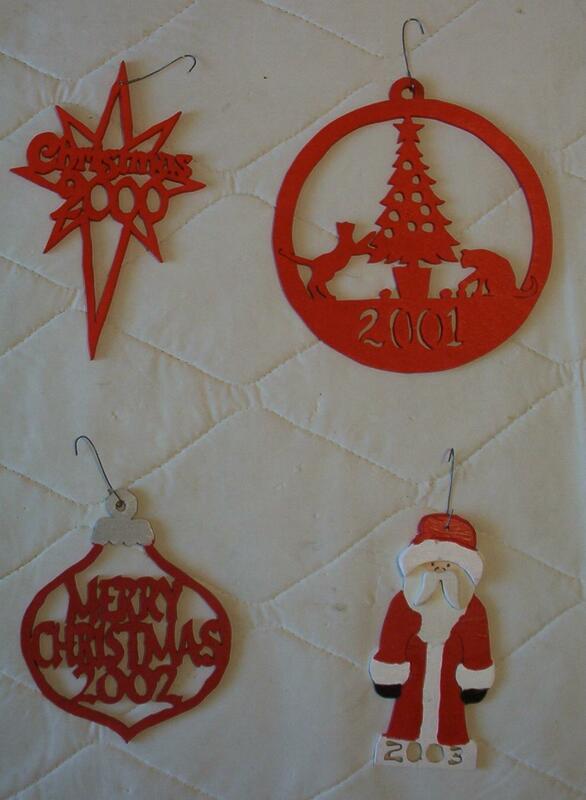 Here’s some of the Christmas dated ornaments that I’ve made. It is a real challenge to come up with something, and I typically figure what I’m making at the last minute, then there’s a mad dash to make enough!